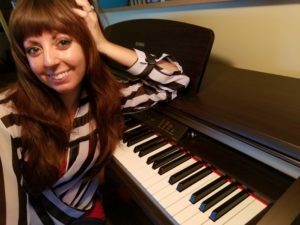 Check out the Piano and Voice Studio of April Anne, considered to be one of the finest performer’s in the field of rock, country and pop music and also one of the most professionally renowned singing coaches and vocal trainers in Arizona! My Music Studio is full-service Studio. I am always the pianist as well as the teacher/coach. Parents are welcome as I have a seating area for them as well as other family members and friends. I also have recording equipment so we can record your lessons and you can make your own CD’s. My passion is training the young singer AND continuing to develop their voices to help them get ready for a career in the music industry. In addition to this, we do live performances 3 times a year to showcase their talents and progress as well as hone their performing skills. I also offer songwriting and music theory classes as well.